Max Gaylard shares memories of his old photos damaged in last year’s Mitchell flood. When I caught up with Max Gaylard on Saturday he was in the back of the Hotel Richards sorting through books, passports and photos damaged in the Mitchell flood. When he was last back in Mitchell he put all his memorabilia in boxes and left them in his niece Alison’s house. Like 70% of the town, Alison’s home was flooded and much of Max’s memorabilia was destroyed. That’s a shame and not just for Max’s memories. Maxwell Gaylard is one of Australia’s finest diplomats and remains a problem solver for the UN in difficult places like Somalia, Sudan, Kurdistan and Gaza. He is a special coordinator for the Middle East peace process and will return to his offices in Jerusalem and Ramallah next week. Born in the Sunshine Coast and living most of life overseas, Mitchell is an odd place to find him though he has good reasons. Along with his brother Rob Struthers and his brother’s wife Irene, Max owns the Hotel Richards on the sleepy main street. Rob and Irene are the normal custodians, with daughter Alison, but whenever Max gets back to the country, he heads out west and gives the other two a break. Max regrets tempting fate but enjoys the change of pace in Western Queensland. But why Mitchell, I asked. “We were looking to buy a pub in 2002 or 2003, and Mitchell was the closest place to Brisbane we could afford,” he said. As we talked, Max rifled through salvageable photos of his student days and he picked out several of prominent people. Here was former defence force chief Peter Cosgrove in fatigues. There was a university rugby league team with Stuart McCosker, husband of Queensland Governor Penelope Wensley whom he also knew well. “Penelope started as a diplomatic cadet in same batch as me,” he said. Gaylard was full of little breakaway anecdotes as I teased out his life adventures. 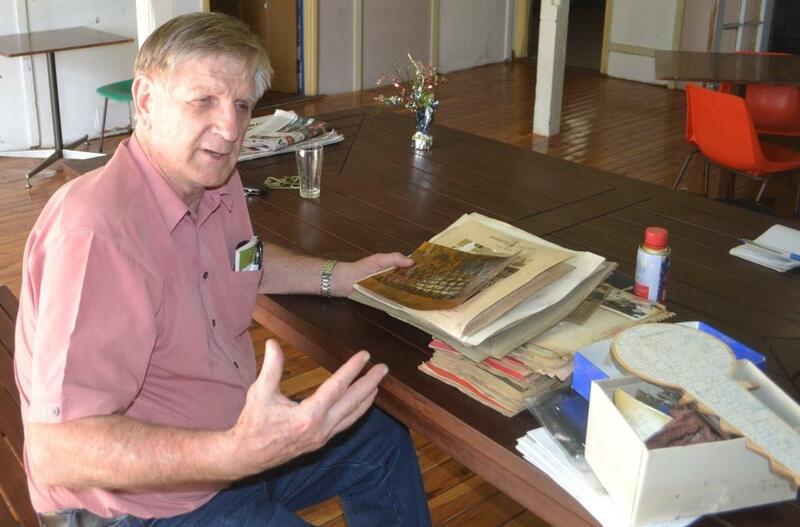 He grew up in Nambour and left in the summer of 1964 bound for the University of Queensland. He studied history and politics and he was also a fine footballer who played first grade for Wests in Brisbane. He remembers an early game against Redcliffe. “This huge fellow from Roma crashed into me and flattened me for two weeks,” he said. That bone-crunching opponent was Artie Beetson and he was one of many to leave a mark on the impressionable young Max. He had his heart set on a career in the Diplomatic Service but his name came up in the army ballot. At college Gaylard had protested against the war, now he was called up to serve in it. He deferred the call-up until he finished his studies. He rolled up at the Foreign Affairs Department hoping to get diplomatic immunity. On the day he started in Canberra, Max was called into the forbidding office of the head of the Department’s office and was told congratulations, he was the first diplomatic cadet to be selected in the army. The year was 1968 and Max did Officer Training Unit and went to Singapore and Malaysia with the First Battalion of the Royal Australian Regiment as part of the Five Power Arrangement. Two years passed by before he returned to Canberra. Billy McMahon was then foreign minister, having failed in his first bid to become Prime Minister. Max said it was a wild and entertaining time before he got his first overseas posting in Mexico. His highlight was to spend $2400 on a painting. A Mexican man approached him and asked him if he wanted to buy Eugene Von Guerard’s painting North-east view from the northern top of Mount Kosciusko. “I had no idea what it was worth but looked up its bibliography and the new Whitlam Government said yes they wanted it for the new National Gallery”. At the end of the 1970s he was posted to Burma. The ice was melting in the relationship with China and Gaylard remembers being invited to the Chinese Embassy in Rangoon for afternoon tea and table tennis. “They beat the crap out of us at pingpong,” he said. The problem was an irascible Dutch-Australian called John Meint Smith. Smith had a chequered career in Australia as a resort manager and was causing trouble in a similar role in the Solomons. He exhorted a group of warriors to force the management team of a resort off the island at spear-point. Gaylard played a prominent role in the police response, by-passing the Solomons Foreign Ministry and causing a major diplomatic incident. The Solomons PM demanded Gaylard’s withdrawal but was opposed by his deputy causing a serious rift in government. Meanwhile Smith threatened to kill him. Smith further muddied the waters with allegations of corruption against Australians. The ABC sent Chris Masters to investigate and in a bizarre interview Masters asked Gaylard if Smith had him by the short and curlies. “I assure you,” Gaylard growled in response, “no one has me by the short and curlies.” But his tenure was fatally undermined and as the situation deteriorated, Gaylard’s three year assignment came to its natural end. Gaylard joined the Commonwealth Secretariat on secondment in London. He became director of Political/International Affairs and was thrown into the problems facing Commonwealth countries transitioning from one-party-state to democracy. Though now ignored because of Robert Mugabe, the 1991 Harare Declaration gave the Commonwealth a fresh sense of purpose in reforming the political system of members based on the rule of law. A succession of dictators came to Gaylard saying a one party state was the best form of government but they were willing to change. He solved issues in the Seychelles, Kenya, Guyana, Bangladesh and other countries. In South Africa, he was involved in the transition from de Klerk to Mandela but his proudest achievement was helping the king of Lesotho return from exile to become head of a constitutional monarchy. Eight years passed by and it was too late to consider another Australian ambassadorial position. He quit in 1997 and joined the UN. He received a letter from Kofi Annan, then head of peacekeeping asking him to stand by to go to Bosnia. “Thankfully he never sent me that message,” he said. Gaylard was transferred to Sudan to deal with dictator Omar Bashir and Southern Sudan’s strongman John Garang. Southern Sudan was moving towards war with the North and eventual independence but Gaylard said it was a tragedy they could not work together in Federation. “When we met the leaders of Sudan and Southern Sudan, they all knew each other well and had gone to school together,” he said. There were more threats on his life. One clan leader told his office that if “Mr Max” came to Baidoa next week, he was going to kill him. When Mr Max finally met the leader, he asked him was he still intending to kill him. “No, of course I’m not,” came the reply. Among his achievements in Somalia was helping wipe out polio with a vaccination scheme. Somalia has been polio free since 2007. In 2007, another difficult conflict came calling. New UN Secretary-General Ban Ki Moon appointed him Deputy Special Coordinator for the Middle East Peace Process. “Journalists said I had the longest job title ever,” he joked. But he was deadly serious in his opinions about the problems in Palestine. He puts it down to three man-made issues or “SOS” as he calls them: settlement, occupation and siege. Complex international challenges have never fazed Max Gaylard but as we walked to the front bar and he poured me a beer, it was clear he enjoyed escaping to the simple serenity of Mitchell. “This place has been my lifesaver, I don’t get out here often enough,” he said. 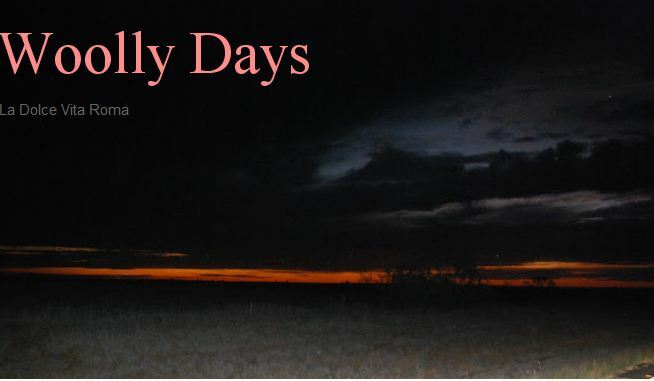 I founded the other version of Woolly Days on Google’s Blogspot in 2005 which has 1548 entries with well over a million words. In 2009 I duplicated the content here on WordPress. But all my writings between 2005 and early 2009 are only on Blogspot. Whether those words are worth saving is anyone’s guess but at moment Google does want anyone else to see them. You cannot visit the site because Google has locked it and made visible to me only as the author. I’ve always found it difficult to dislike Google. Though they are one of the world’s largest information technology companies driven by profit imperative they continue to have good karma. Evangelists like Jeff Jarvis see them as the gamechanger benchmark constantly asking us in any situation what would Google do? Their search engine revolutionised our relationship to information. Over 10 years they ensured an enormous store of knowledge was no further away than our fingertips. I still use their search and I also love their maps, even their blogs (I update my second site Irish I’s irregularly where I post things that amuse me.) But my experiences with Google are increasingly dominated by their thuggish practices. On January 20, 2013 I got a terse email from an address called “Google Blogger Support”. The email’s contents weren’t very supportive. Signed off by the “Google Team”, the email told me Google had received a Terms of Service complaint regarding malicious code on my blog. “After conducting our review, and in accordance with Google’s Terms of Service, we have removed the content at issue,” the “Google Team” said. They provided links to the Terms of Service and their Content Policy but there was no explanation which element I was in breach of or what code was malicious. Was it some content that offended someone? There were plenty of words bound to offend someone. Google wouldn’t say who made the complaint or how I could respond to the charge. I was angry when I wrote it and in my hurry it had a very curious mistake.My “Snyder eexplanation” is a combination of a typo and ‘damn you autocorrect’ moment – it meant to read ‘any explanation’. I have no idea why my Google powered Android phone changed “any” to “Snyder”. But I need not have been embarrassed because Google paid no attention to my screed. I got the standard auto reply “Unfortunately, we are unable to answer email that is sent directly to this email address.” They gave me places to go if I wanted help with a technical issue, answers from the help forum, wanted to learn about features or even if I wanted to report a violation of Blogger’s Terms of Service. But there was no place to go if you were a victim of such a report. On my blogger dashboard, I found it was listed as a locked blog but I could request an unlock review. I did so but received no reply. When I next logged onto the dashboard I saw another cryptic message that the blog was “in violation of Blogger’s Terms Of Service”. They advised me to “fix the problem” before Google would re-review. But what was the problem? The Google terms of service are 1691 words long and I have no idea whether I am violating all of it or some sentence of it. Frustrated, I got rid of a few things they mentioned might be issues that I thought were harmless. I removed the html code for my stat counters and a few modest ads. But that didn’t help. I put in a second unlock review after I removed the possibly offending content. Google responded with silence. I remain in a Kafkaesque world guilty of some unknown offence with no way of redressing the problem. I don’t know what the ‘malicious code’ (and doubt I have the html skills to be really malicious) nor do I how what the TOS violation is, but I suspect it is a very minor infraction of inconsistently-applied rules. I still want Google to unlock my blog though I will never update it again. Blogspot is their platform but Woolly Days is a part of the public record and Google have no right to interfere with it. It is the behaviour of thugs and censors.